My best bird this weekend had to be Brant, a hard goose to get on Lake Ontario. Corey’s best bird was also a goose, specifically a Cackling Goose, although a Long-eared Owl in Brooklyn came in a close second. Charlie hasn’t let us know yet what kinds of geese he saw this weekend but I trust they were golden. 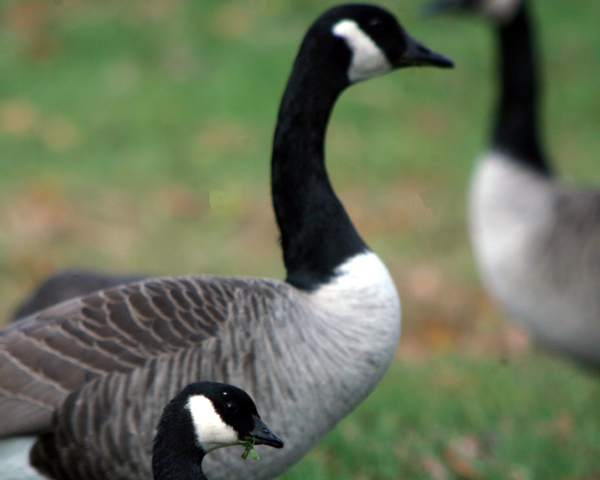 Check out Corey’s Cackling and Canada Goose, side by side! My best birds of the weekend were the Egrets returning to their nesting site at Hunter Wetlands. Each year there seem to be fewer birds but they are still amazing to see in their hundreds, crowding into the Melaleucas in the paperbark swamp. Cattle Egret dominate, with Eastern Great Egrets next in number then Straw-necked Ibis, Rufous Night-herons, Intermediate Egret and Little Egret. I found a Western Grebe in South Amboy, NJ on Raritan Bay. @Patrick: Now that is a good bird! Far from a rarity, but a measure of how good a bird dog our puppy is becoming: yesterday afternoon he and I sat and watched a Crissal Thrasher eating hackberries from the path. Hey, mine was a pileated woodpecker, too! I know, it’s not particularly exotic, but it was pretty fun to point it out to my best friend’s six-year-old from their living room in Manassas, Va.
At the Lake Erie Metropark Hawkwatch, in Michigan, we got a close flyover Golden Eagle. Close second was about 80 Tundra Swans. Here in Dallas, Texas, the highlight was a first-of-season twofer: redheads and northern pintails arriving on the same morning (within 15 minutes of each other to boot). And Patrick: I’m thinking this is a strange (or exceptional) year for western grebes. We had one here in Dallas for about a week, and I’ve seen reports of another one in the Texas panhandle at the same time. Seems a good season for vagrants! Too busy for birding, but I did have nice views of a Carolina Wren busily feeding on a suet cake while I was a few feet away, painting the front door. Not exotic and not exactly gorgeous either but a herring gull set the pulses racing in Redditch after I’d dipped on Wilson’s phalarope at Slimbridge but got Bewick’s swans (aka tundra swans) anyway. On a Lake Erie pelagic trip out of Cleveland we had Pomarine Jeager and Purple Sandpiper. It was a great trip put on by the Black Swamp Bird Observatory. @Arie: That mouse was cool! And I will catch you…it just might take me a decade or so. Visited Brigantine for the first time this past Sunday. Saw some really great birds but my favorites were 3 surprisingly cooperative Clapper rails. The large flocks of snow geese were also a real treat! I got rained out at Quebrada Gonzalez in Costa Rica and therefore had very few birds. On the drive back though, we had a pair of Bat Falcons perched high up on a snag next to teh Rio Sucio. On vacation in New Mexico and stopped at Bosque del Apache NWR to see the Sandhill Cranes (of which there were thousands) and picked up an Aplomado Falcon that had been hanging around for a week.